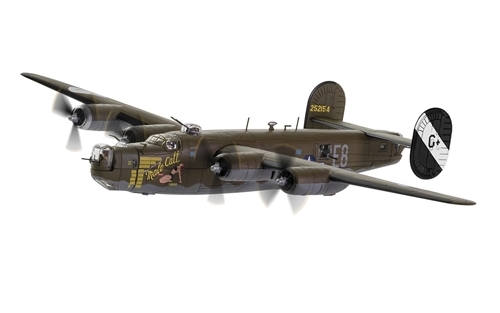 Life for the B-24 heavy bomber began in 1939, when the Army Air Corps initiated a request for a new bomber designed to exceed the performance of the B-17. Consolidated Aircraft responded quickly with its proposal, labeled Consolidated Model 32 and, on March 30 of 1939, was awarded the contract. One day short of nine months later, on December 29, 1939, the first flight of the XB-24 bomber prototype took place. Life for the B-24 heavy bomber began in 1939, when the Army Air Corps initiated a request for a new bomber designed to exceed the performance of the B-17. Consolidated Aircraft responded quickly with its proposal, labeled Consolidated Model 32 and, on March 30th, 1939, was awarded the contract. One day short of nine months later, on December 29th, 1939, the first flight of the XB-24 bomber prototype took place. Our Price: $169.99 Sold Out!